I largely agree with you, I’m no Chomskyian, but I think you left a couple of key points. One, you never mentioned poverty of the stimulus and that’s a HUGE component of generative grammar. You can’t talk about Chomsky without mentioned POS and I’m sure it’s in Pinker’s book somewhere. It’s part of the standard argument in favour of UG: the learning data isn’t sufficient to learn the language, but children learn it anyway, therefore there must be something built-in.That conclusion is poppycock of course, but I think it’s extremely unfair of you not to mention that poppycock. Two, there *is* a biological component to language. It’s absurd to claim otherwise. And it’s obviously specialized to humans. Raise a kitten and a human infant in the same linguistic environment, and only one of them will learn to talk. I get the feeling you are trying to criticize this point and I don’t understand why, since these are clear and indisputable facts. But again, they aren’t sufficient to convince me that UG is actually a thing. You’re right, I deliberately left out the POS argument. It is in Pinker’s book and his argument that Motherese is “folklore” is part of it. And you’re right, it is poppycock. But I left it out because I was planning on putting it in the next article since Sampson breaks it down much better than I could. I also didn’t want this post to turn into a step-by-step tear down of Pinker’s book since that’s what Sampson’s book is (and since I was trying to keep this post relatively short). 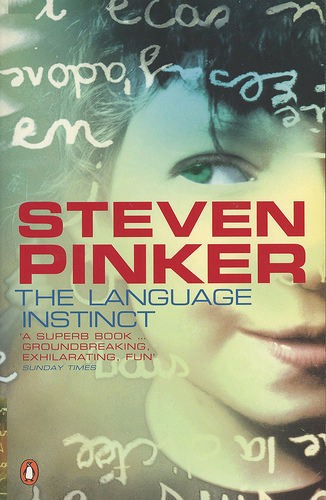 It’ll probably be a good idea to sum up Sampson’s arguments against the language instinct idea, if only for readers who aren’t steeped in linguistic theory (and who, coincidentally, are the people Pinker’s book is aimed at). So thanks for bringing it up. If I can do it succinctly, I’ll include it in the Sampson post. If not, I’ll have to turn the Sampson post into a two-parter. Stay tuned! As to your second point, I should have been more clear on that. Of course there is some biological component to language. I hope I didn’t sound like I was claiming otherwise by leaving that out. I wasn’t trying to criticize that point since I agree that language is part of human biology, but I was trying to criticize the idea that saying there is a biological component to language does not mean we need to make a leap of faith into believing in UG. That is what the Chomskyians want us to do even though it is completely irrational since there is no hard evidence. As you say, the evidence isn’t “sufficient to convince me that UG is actually a thing.” How very logical of you. Sounds good! I look forward to the next installment. Pinker’s book has been pretty influential in the public so I think it deserves some reviews like yours.